Attic Cleaning Sanitize Your Attic Today! Attic Insulation Reduce Energy, Noise and Pests. Up 500% over recent years according to Dr OZ and other sources state increase for potential infestation is real. Before starting you home insulation project, learn about the benefits of TAP Insulation. TAP stands for Thermal Acoustical Pest Control Insulation and is a natural based cellulose/fiber insulation which has been treated with borates to provide pest-controlling properties. TAP has also been treated to be fire-retardant, thermally superior and have sound-deadening affects. » Thermal insulation as a material designed to hold back the transfer of heat or cold surfaces using a arrangement of air-filled cells or voids to keep temperatures separated. As a result TAP keeps your home cool in the summer and warm in the winter further increasing Energy Savings year after year. Reduce unvarying temperatures between floors and ceilings, upstairs and downstairs and exterior walls. Energy Savings simply due to TAP insulation properties not having the leaks and drafts associated with ordinary insulation, so HVAC mechanical systems do not need to work as hard. » Acoustical insulation as a soundproofing material reducing the intensity of sound. » Pest Control insulation, EPA approved and pesticide labeled to provide control of listed insects. TAP insulation, otherwise known as Thermal Acoustical Pest Control Insulation (TAP®) is primarily made from ground-up newspaper. The new paper fibers are then treated with a specially formulated borate solution to give the product its pesticide qualities. The result is a safe and highly effective insulation and pesticide that is environmentally sensitive as well. Please visit our TAP insulation information page to find out more about this service. Caring for your home or commercial property is our business. We're not satisfied until you're satisfied. So, if you have a pest control problem between treatments, we'll keep coming back until it's solved or we'll refund your last service payment. Bell Termite Control's guaranteed service is second to none. We have over 15 years experience, and over 75 thousand satisfied customers to prove it. Are you a new customer? Call us at (888) 699-9808 or schedule a Bell Termite Control service using our convenient Schedule Service Form. If you're not completely satisfied with your termite program's results, simply call Bell Termite Control within 30 days of your initial treatment. If Bell Termite Control is unable to rectify the problem within 30 days of your documented notification, we guarantee to refund your initial treatment charge and any prepaid renewal, its that simple! Home ownership is at the top of most treasured investments. It is where you relax, share feelings, create memories and experiences. Your home protects you from the elements, provides shelter from warm on a cold days and is a place of refuge from the weather while offering comfort and privacy. With the ease of online information homeowners are always looking for products and services that could lower their heating and cooling bills while adding value to their home, guard their family's health, and sustain comfort. The video below is for demonstration purposes only. Similar procedure with blowin in celluloce type insulation. 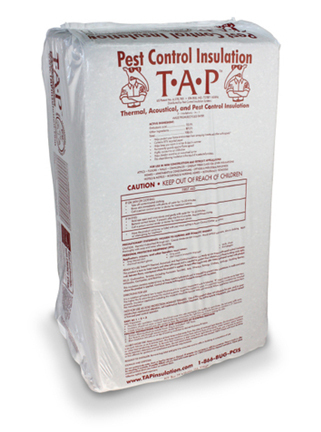 Bell Termite Control installs Thermal Acoustical Pest Control Insulation (TAP®) offering a higher level of protection. Most homes in Southern California are in need of additional attic insulation due to outdated insulation building codes which are not considered enough due to rising energy costs and increasing environmental concerns of fossil fuel consumption and global warming. Bell Termite Control, is the attic insulation company to call for professional attic insulation installation. If you are looking for attic insulation in Los Angeles, attic insulation in Orange County, attic insulation in San Bernardino and attic insulation in Riverside, Bell Termite offers affordable dual purpose attic insulation such as TAP Insulation which also has pest control properties. Our technicians will explain you how TAP insulation works for your home. We offer free attic insulation estimates and inspections. 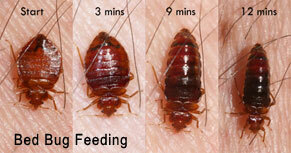 Please keep in mind that TAP insulation is applied by licensed pest management professionals. Thermal Acoustical Pest Control Insulation (TAP) is primarily made from ground-up newspaper. The new paper fibers are then treated with a specially formulated borate solution to give the product its pesticide qualities. The result is a safe and highly effective insulation and pesticide that is environmentally sensitive as well. TAP Pest Control Attic Insulation is a "loose-fill," cellulose attic insulation, so it is installed by being blown into attics on top of existing insulation. It can also be installed in attics and walls of new construction homes with specialized machines. TAP attic insulation reduces your energy bills by keeping your home warmer during winter and cooler in summer, TAP Pest Control Attic Insulation offers permanent pest control protection from common household insects that nest in attics and walls like Ants, Booklice, Centipedes, Crickets, Darkling Beetles, Earwigs, Millipedes, Roaches, Silverfish, Sow Bugs, and Termites (including Formosan Termites). TAP Pest Control attic Insulation is a superior attic insulation product that guards against mold and mildew and offers tremendous acoustical control and fire resistance with year-round energy savings. TAP Pest Control attic Insulation also provides permanent pest protection backed by a limited lifetime warranty. Is TAP Pest Control attic Insulation an EPA-registered pesticide? TAP Pest Control attic Insulation is the most trusted pest control attic insulation on the market today and is an EPA-registered pesticide that is also an insulation. Our attic insulation is backed by scientific studies to control bugs and protect your home. In comparison, other attic insulations might be treated by an EPA-registered product to protect the attic insulation itself but fail in protecting your home from pests. TAP Pest Control Insulation, however, is an EPA-registered insulation and has the unique advantage of protecting your home from pests. Click to review the EPA label of TAP attic insulation. With lots of green products these days, is TAP Pest Control Attic Insulation really environmentally friendly? When you view the entire product life-cycle from production to operation to disposal, cellulose insulation is one of the greenest building products in the world. 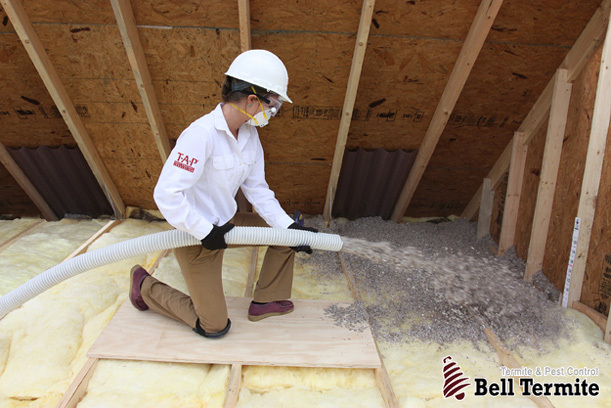 Cellulose attic insulation takes less energy to make than other attic insulation products, is made from 80%+ recycled paper, reduces a home’s carbon footprint by saving energy, and provides no post-installation waste. Does TAP Pest Control Attic Insulation have to be renewed or replaced to continue to control insects? No, pests cannot tolerate the borates in TAP Pest Control Insulation, so the pest control properties remain in working as long as the insulation remains in the home. Boric acid works by attaching to the bodies of the pests as they crawl through or nest in the attic insulation. As these pests are “self-grooming” insects, they ingest the boric acid when they groom themselves. Since the pests cannot excrete the boric acid, it accumulates in the gut eventually proving lethal due to dehydration, malnutrition, or both. How long does it take to install attic insulation? Installing Thermal Acoustical Pest Control Insulation over existing attic insulation normally takes half a day. However, attic insulation installation time depends on the size of the home. There is a good possibility that your current attic insulation does not have pest control properties, so adding TAP Pest Control Attic Insulation would be greatly beneficial. The U.S. Department of Energy recommends a significant amount of insulation (R-49) in residential attics but many homes do not have enough insulation due to minimum building codes requirements. It is estimated that 65% of U.S. homes are under-insulated, and the majority homes over 10 years old have about 1/3 of the recommended amount of insulation. 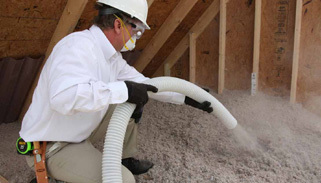 Does TAP Pest Control Attic Insulation have an odor? The borates in Thermal Acoustical Pest Control Attic Insulation actually help absorb and reduce any odors. Do I need to remove my existing attic insulation before installing TAP Pest Control Attic Insulation? No, Thermal Acoustical Pest Control Attic Insulation can be installed on top of your existing attic insulation as long as the existing attic insulation is not damages or soiled by pests or rodents. How is Thermal Acoustical Pest Control Attic Insulation installed? TAP Pest Control Attic Insulation is blown in using a machine. As Thermal Acoustical Pest Control Attic Insulation is blown, it forms a perfect fit by covering all nooks and crannies around the structure of your attic. Typical attic construction leaves minor offsets between studs creating gaps and voids form when traditional insulation rolls are used. Unlike the traditional attic insulation rolls, TAP Pest Control Attic Insulation is never cut or stuffed into cavities to fit behind conduits and pipes reducing the effectiveness of insulation. On the other hand Thermal Acoustical Pest Control Attic Insulation is blown in covering your ceiling like a blanket. There is a widespread myth portrayed by some within the insulation industry that cellulose products which are made from wood and forest products can easily catch fire. Thermal Acoustical Pest Control Insulation (TAP) contains fire-retardant properties making homes safer and less susceptible to fires. Conventional insulation can melt creating a chimney-like effect in a wall. TAP Pest Control Insulation, has fire-retardant characteristics which won't hold a flame and forms a 'charred' surface barrier limiting the spread of fire. Thermal Acoustical Pest Control Insulation is made from recycled paper and specially formulated borates. Due to the close supervision of pest control products by governmental agencies, Thermal Acoustical Pest Control Insulation must be registered with the U.S. Environmental Protection Agency and can only be installed by licensed pest management professionals. There are a few factors that influence cost of installing Thermal Acoustical Pest Control Attic Insulation like installation access, location, market, size of home, etc. Thermal Acoustical Pest Control Attic Insulation most often pays for itself by reducing energy costs which is a valued point for a discriminating homeowners looking for the best energy savings and pest control options available. Request a FREE attic insulation quote and attic inspection today! How does Thermal Acoustical Pest Control Attic Insulation reduce my energy bills? TAP Pest Control Attic Insulation will keep your home cooler in summer and warmer in winter by reducing heat transfer through walls and attics. Thermal Acoustical Pest Control Attic Insulation is denser than conventional insulation and limits air to move through it. Thermal Acoustical Pest Control Attic Insulation will resist heat transfer through convection, conduction and radiation. Thermal Acoustical Pest Control Attic Insulation also prevents leaks and drafts associated with common attic insulation due to its consistent and evenly applied format as it gets blown in and around all pipes and studs not leaving pockets uncovered. As a result, all areas in the home maintain more uniform temperatures between floors and ceilings, upstairs and downstairs, even next to exterior walls. Where can I buy TAP Pest Control Insulation for my attic? When you schedule a FREE Attic Inspection our Bell Termite trusted pest management professional will provide more information about TAP Pest Control Attic Insulation and provide upon request a free, no obligation quote for TAP attic insulation installation. Does all cellulose insulation control pests? 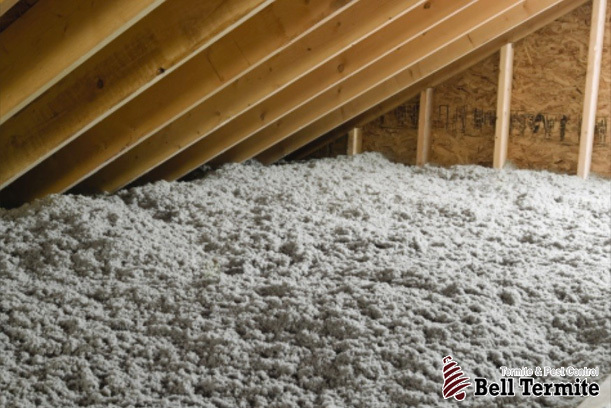 There are many brands of attic insulation that claim to use boric acid, borates and derivatives of borates but depending in the formula and concentration of such chemicals will vary on their effectiveness against insects. Therefore without adequate testing and registration of such concentrated dosages in varying attic insulation brands, it would be difficult to conclude which is best suitable and can be best ingested by insects. This is why Bell Termite only uses products that have been scientifically tested and provide an EPA label confirming such statements like Thermal Acoustical Pest Control which can legally claim to control insects. Does Thermal Acoustical Pest Control Attic Insulation control mice, rats, or squirrels? Rodents are not affected by borates in the same manner as insects when digested but nevertheless, Thermal Acoustical Pest Control Attic Insulation does not act as a food source for these animals. We strongly suggest to consult one of our Bell Termite Control exterminators for best practices to control rodents by requesting a FREE Attic Pest inspection today! I got a cheaper quote from a contractor stating his insulation is similar as TAP Pest Control Insulation but at a cheaper price. Is this true? No. -Please note that Thermal Acoustical Pest Control Attic Insulation (TAP) can only be installed by licensed pest control professionals and would recommend to inspect the EPA label for its effectiveness in comparison to Thermal Acoustical Pest Control Insulation. Does Thermal Acoustical Pest Control Attic Insulation repel or resist insects? Scientific studies reveal that boric acid is undetectable to insects. Insects cannot be repelled from something that they cannot detect, so individuals or companies that make such claims are uninformed about the scientific properties of boric acid. Thermal Acoustical Pest Control Attic Insulation is lethal to certain insects that come in contact with the insulation but be aware of companies claiming that the boric acid in their product resists or repels insects. We strongly suggest to consult one of our Bell Termite Control exterminators for best practices to repel or resist insects in your home by requesting a FREE Attic Pest inspection today! Locally owned and operated, Bell Termite & Pest Control proudly offers Attic Clean-Up and Sanitation including Attic Insulation Services. Our goal is to provide all our customers with excellent workmanship, pricing and service for all phases of your Pest Control needs. We are small enough to provide you with personalized, prompt service throughout all phases of your project till final completion. We provide Pest Control services for residential, associations, commercial, and multi-family properties. We offer alternative, non-toxic ( Timbor "toxicity level of table salt") treatments, including FOAM (borates) and ORANGE OIL. Our Meet-or-Beat aggressive pricing offers you the best of both worlds, experience and value. And since Bell Termite Control Inc. values our clients, we invite any Property Owner, Property Management Company, Real Estate Agent or Bank to feel free and Request a FREE Pest Control Inspection of Your Attic. You Ring The Bell, We Bring The Service.